Here's how to edit Advetisment Shown on your Facebook account based on your interest. Are you tired of feeling being stalked by Facebook? Don't you feel the goose bumps when you have just seen this webpage and the advertisement of that website keeps showing up on your Facebook Newsfeed ? I hate that feeling as if an advertisement is trying to brain wash me or stalking me. Recently Facebook has known of selling our personal datas misusing them even for political purposes and it has caused a huge raged amongst us Facebook users. brain wash or influence the society in the future. We humans must stand against these information leakage and protect ourselves by changing these settings provided by Facebook. So here's some tips for you that might protect your own data from being used by Facebook for advertisment purposes. Steps to Protect your information from Facebook. and then go to ADS column +circled in yellow. 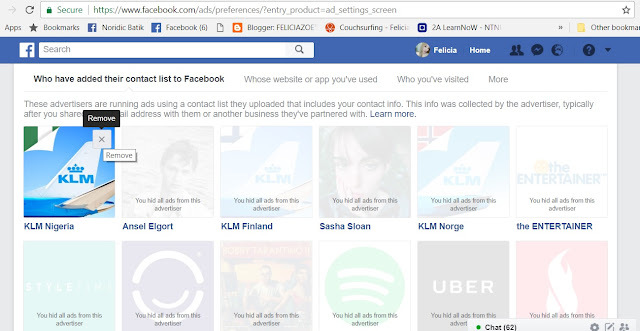 It will show you this page where you can manage whether or not Facebook can show you Ads that are intended to Reach you based on your Relationship Status, Employer, Job Tiitle + which are all your personal informations. On the Right end, Scroll towards your Left to Disable them. Manage the ads based on Who you have added to your contact lists or Like liksts on Facebook. Go to the every image boxes right corner and click X which shows the Word Remove. and Changing it to NO. 5# How to not let others see what you Like and which pages you like nor hiding the post where you shared. + This way, it would allow you to keep it a secret from letting others know about your personal interest on all the pages you like nor share without your approval. by just scrolling the Right option to Left. Finally You are Done ! related to your interestes where there are higher chances to manipulate your brand awareness and purchasing decision making or even political awareness. I hope this would help you guys out in protecting your own Facebook Account and personal information as most of us are so unaware about how powerful these personal info that could affect each and our everyday life decision making process. Be / Choose your own life and things, Dont get influence by Huge Brands that are intoxicating our minds daily on overpriced items.